Doug: Today's post-gluttony conversation is on back-up vocalists in popular music -- sometimes surprising us! Think about it -- there have probably been many times when you've heard a song for the first time, and you're suddenly beset with a feeling of, "Hey, that sounds an awful lot like..." And, to be honest, sometimes you're flat-out wrong. Today we'd like to hear examples of favorite collaborations between the lead artist and their well-known back-up singer(s). Doug: I'll start. Well, actually I'll start with a mistake I made for some time until I finally had the resources (i.e. the Internet) to look it up. I forever thought that Dolly Parton sang back-up on the Eric Clapton hit "Lay Down Sally". Fooled me! Actually, a somewhat famous artist did sing on that record -- Yvonne Elliman. Marcella Detroit also sang, and to be honest I'm not certain which lady fooled me, but I'm thinking it was the latter. As to collaborations I'm certain of, how about Phil Collins singing on the Howard Jones hit, "No One Is to Blame"? That tune, which I heard on the radio last week, actually serves as the inspiration for today's topic. I'll leave you with one more before I turn it over to my partner -- then it will fall to you. John Stewart was a former member of The Kingston Trio when he became a one-hit wonder with 1979's "Gold". Stevie Nicks, then riding the high crest of popularity from Fleetwood Mac's success, sang back-up on that track. If you click the link on Stewart's name, you'll be taken to the Wikipedia page about him -- and how about that? I had no idea he wrote "Daydream Believer" for the Monkees! Karen: Since I've been in a Stones mood lately, how about "You're So Vain" by Carly Simon, with Mick Jagger on backing vocals? Of course there was speculation that the song actually was about Jagger for many years, but it seems that it most likely was about Warren Beatty. Still, given the lyrics, one can see why people would draw that conclusion. 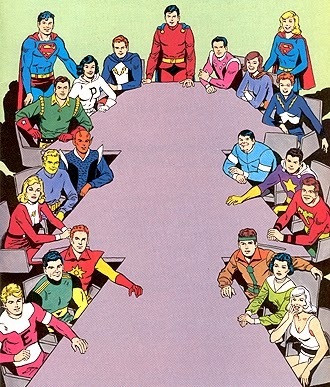 Karen: OK, it's your turn: let's hear about your favorite musical team-ups here. Doug: Thanks to each and every reader who contributes to the camaraderie that exists on this blog. We wouldn't, and couldn't, do it without you! 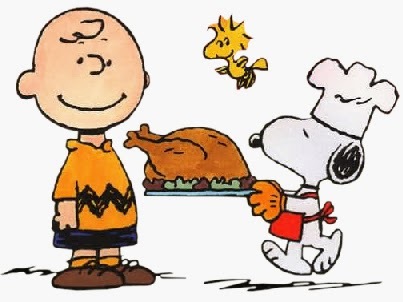 We hope that you have much to be thankful for today. Pietro, the Vision, and Namor at the same gathering. Think a fight could break out? Doug: Today's post came as a suggestion from an Anonymous reader in a comment left in the Suggestion Box last Sunday. Thanks! Who's the Best... Hands and Feet? 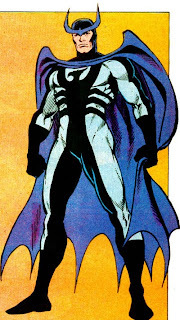 Doug: It's a combination post today, folks, as we ask you to pick your favorite superhero accessories. 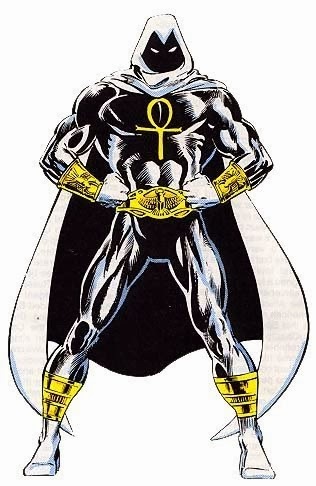 Which characters have the best gloves (or if you're partial to Benjamin J. Grimm, the best hands), and who sports the coolest footwear? 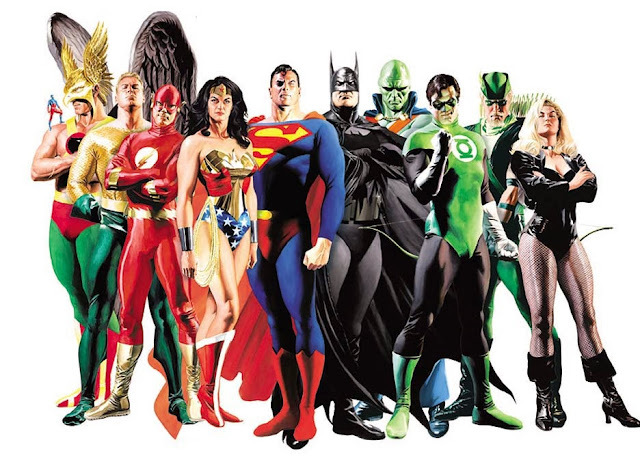 Labels: Dressed for Success, Superhero costumes, Who's the Best? 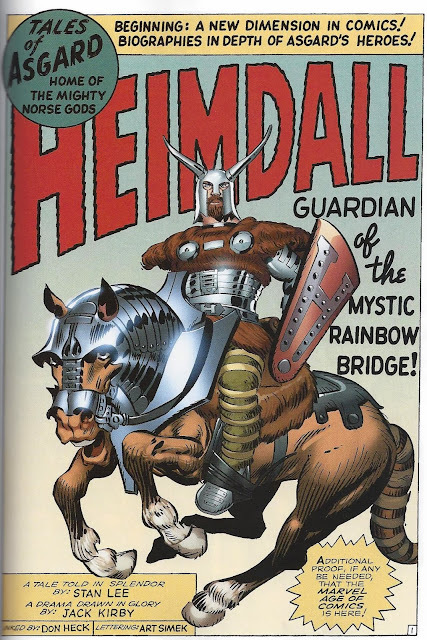 "Heimdall, Guardian of the Mystic Rainbow Bridge!" Karen: This time around, we're focusing on one of Thor's supporting cast, that far-seeing guardian of the Rainbow Bridge, Heimdall. 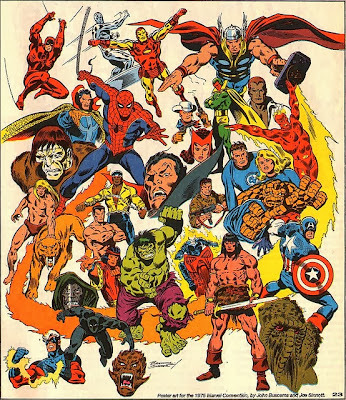 You'll notice the inker on our first tale is Don Heck, and of the various inkers we've seen on these short stories, I'd probably place him in the middle of the pack. He's not bad but I still prefer Colletta far and away on Kirby when it comes to Thor. Doug: Karen had mentioned to me in an email after she was done with the framework for this post that we were going to see a "new" inker over Kirby in this story. I was surprised when I opened the tpb for reading that Heck was on the assignment. However, after much scrutiny I declare that I really couldn't tell that it was the Dashing One doing the embellishing. 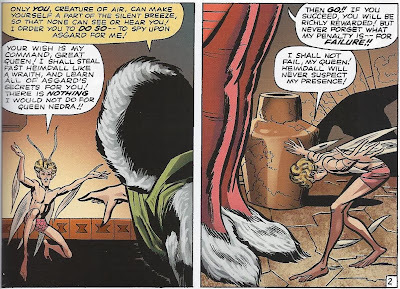 In fact, I'll wager that I could have guaranteed that it wasn't Vinnie, but would have been hard-pressed to identify which of Kirby's other Silver Age inkers I was seeing. It's Vinnie all the way for me as well. Karen: This tale tells us how Heimdall became the guardian of the Rainbow Bridge. 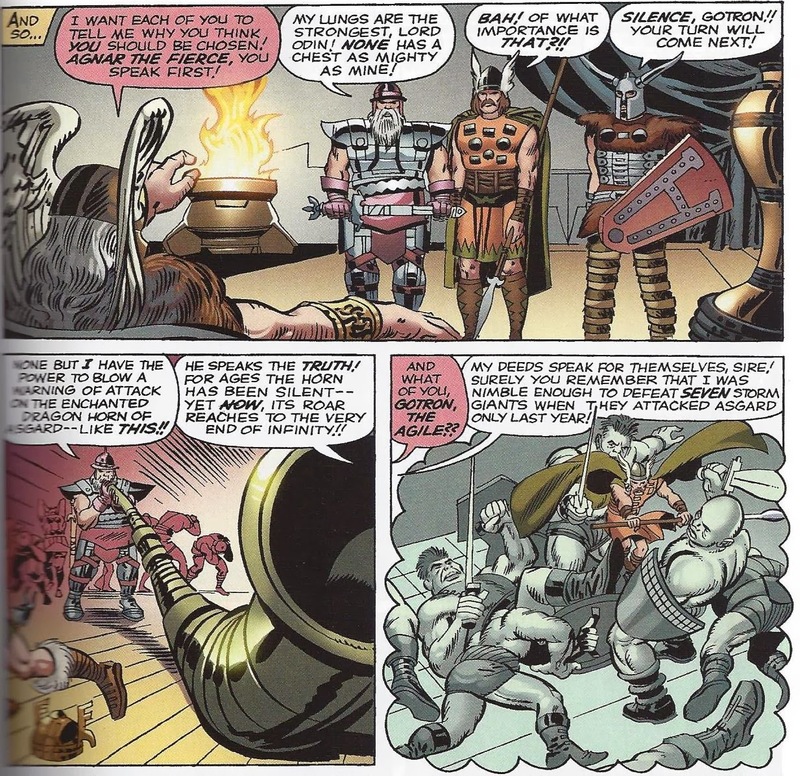 It seems that the enemies of Asgard have been using the bridge to make their attacks upon Asgard, and Odin has decided he must appoint someone to guard it. Makes sense. 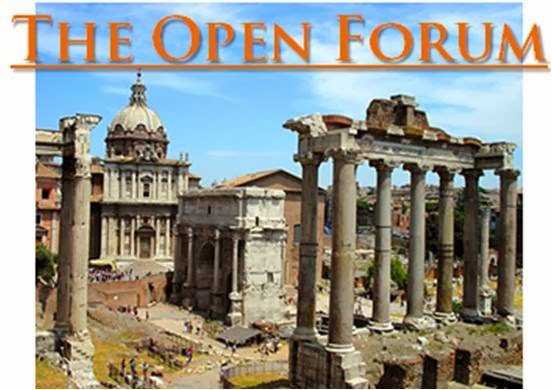 But as with all things in the godly realms, rather than just look over resumes, Odin has selected three candidates and he summons them before him to make a case for themselves. The first, Agnar the Fierce, demonstrates his powerful lungs by blowing the enchanted dragon horn of Asgard. It's such a powerful blast that it sends the Asgardians running for cover. Agnar says he can warn all of the realm if any foes were to attack. 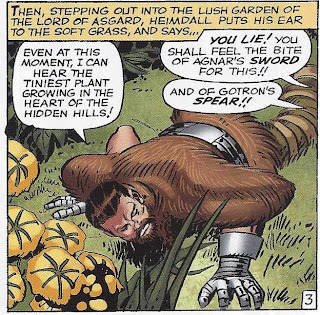 The next candidate, Gotron the Agile, describes how he took down seven storm giants that attacked the realm the previous year. 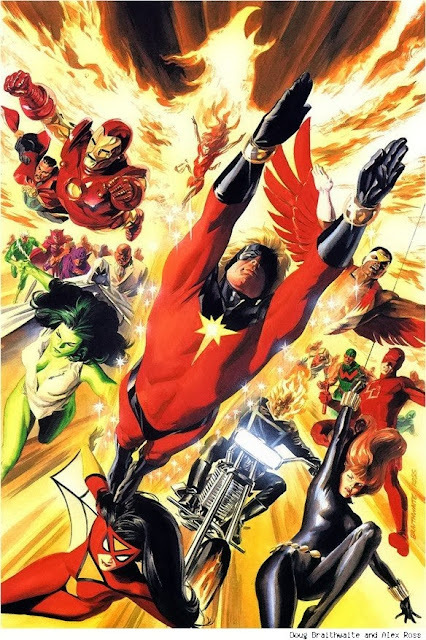 Doug: The Asgardians have nothing on the Inhumans in the exploitation of other races department. As the Inhumans kept the Alpha Primitives as subservient, here the Asgardians have "a force of trolls" doing repair work on the damaged Bifrost, while in an earlier story we saw Thor journey to Mirmir to encounter a gang of dwarfs, who "forged all the enchanted weapons of Asgard". Now maybe these little dudes are just good at their various crafts, but it does look a little suspicious when the much-larger Nordic-looking gods are free to make use of the toil of these "little people". Karen: It seems like Stan used the terms "trolls" and "dwarves" somewhat interchangeably for a while, but yes, your point is well-taken. In the myths the Dwarves did produce awesome goods for the gods but usually there was payment. Here it does have that uncomfortable feeling of the caste system -or worse. Doug: I thought Agnar (at first I misread that, and thought I was getting Angar the Screamer!) and Gotron were typical blowhards, while Heimdall displayed a reserved nobility. Fandral's a blowhard, but he's not all about self-promotion. 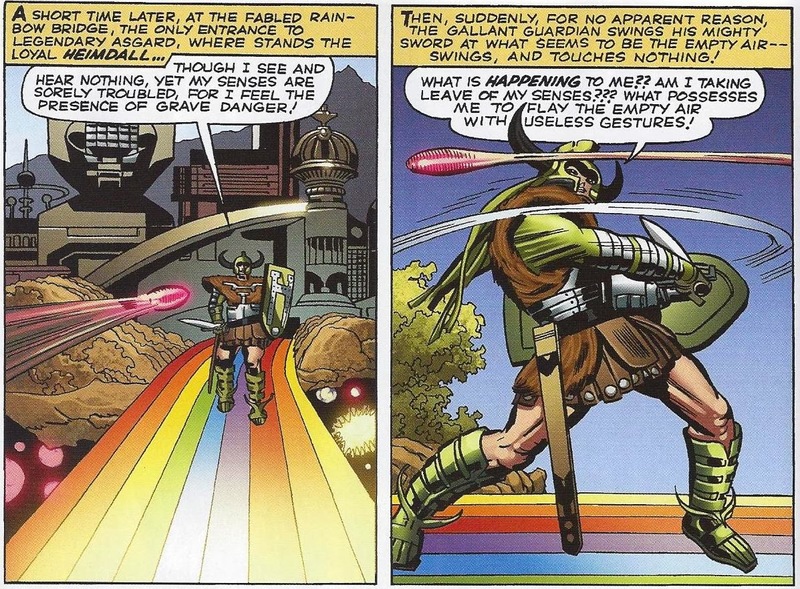 And think what these guys were applying for -- am I correct that Heimdall never leaves his post on the Bridge? Karen: Finally, Odin turns to Heimdall the Faithful and asks him what he has to say. 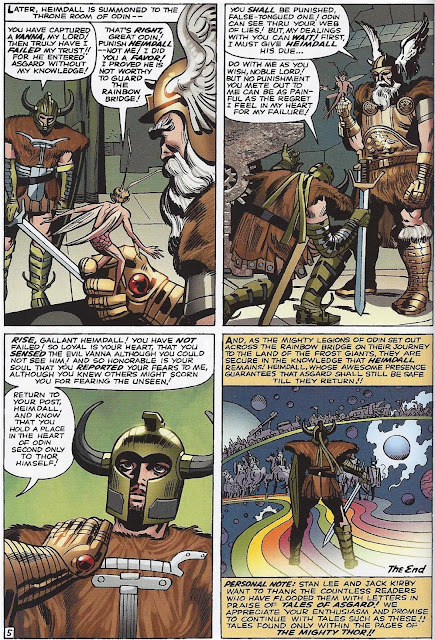 Heimdall removes his rather large helm and tells his sire that he can sense danger approaching before anyone else can. To prove it, he lies upon the ground and places his ear to the grass. He tells Odin that he can hear a tiny plant starting to sprout in the Hidden Hills. This outrages his two competitors, who accuse him of lying. Odin silences the men, and then sends his gardener out to the hills to check on Heimdall's claim. 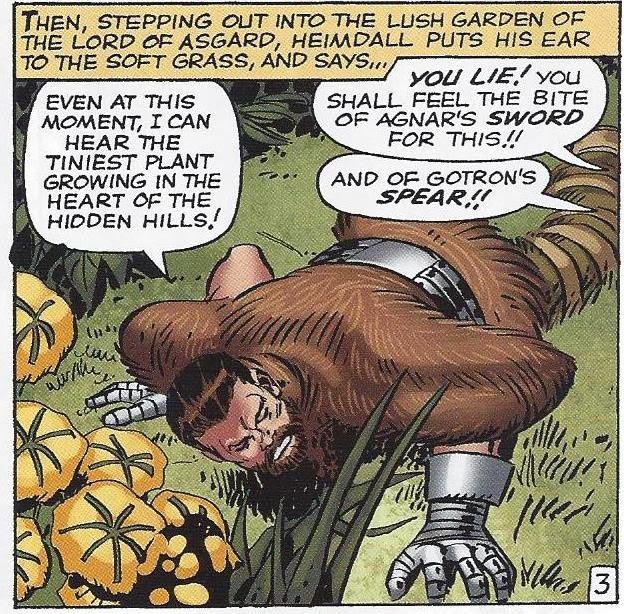 The gardener is rather rotund and reminded me of Volstagg -but of course he predates that mighty warrior. The gardener goes out to the desolate hills, which had been scorched by a dragon's breath, and is stunned to find a small plant just breaking through the soil. He brings it back to Odin and the All-Father is pleased, but remarks that he has heard that Heimdall has other powers still. The warrior says yes, he can see across time itself, and at this moment, he sees a war party of giants not two days out from Asgard. Odin sends a force of warriors out to check and they come back with the king of the giants in tow. This is all Odin needs to make his decision. He declares Heimdall guardian of the Rainbow Bridge "forever!" Doug: OK, so I'm back to a question that I asked two weeks ago. Do all of the Asgardians have certain powers, and/or are they all the God of This-or-That? 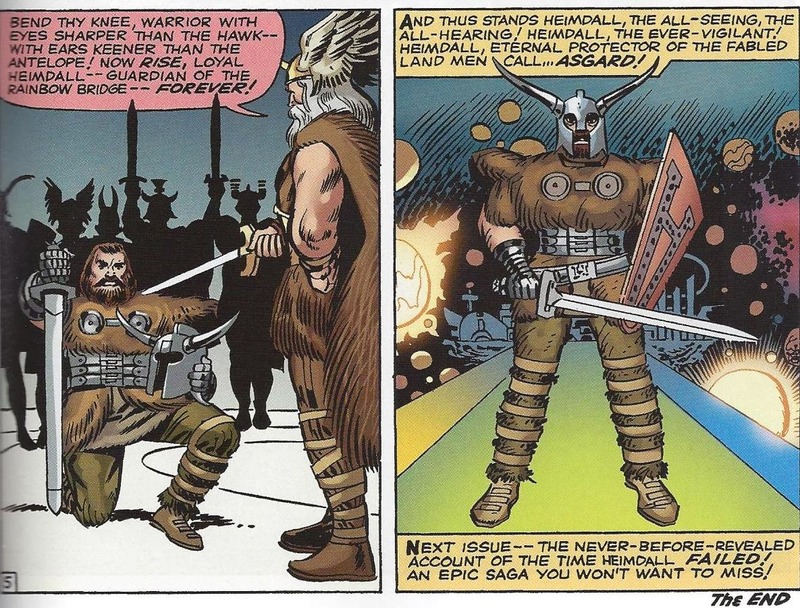 And I'm wondering if Odin was just being conversational when he said he'd "heard" that Heimdall had other powers. Ya think he'd know! Maybe omniscience ain't what it used to be... 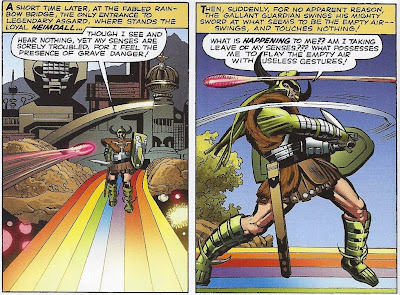 I really liked, though, this two page explanation of and display of Heimdall's powers. There have been times throughout comics history when creators have done a nice, yet subtle, job of bringing new readers along. This explanation fits very organically into the story. I enjoyed this one -- these short tales are fun. And I think we've heard some commenters voice concern over the Claremont/Bolton add-ons in the back of Classic X-Men as retconning the classics. I don't have that sense here -- this is more like an "untold tales" sort of deal, and in my mind does not offend the material either in the front of Journey Into Mystery or any Thor stories that had come before. 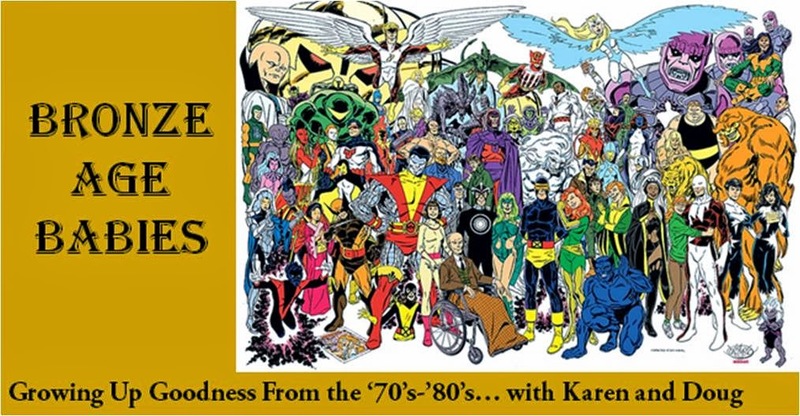 Karen: Another story, another inker! This time it's George Bell, aka George Roussos. I wasn't a big fan of his FF work, and I think his inking comes off a bit heavy here, particularly in comparison to Colletta's feathery work. Our story is another Heimdall-centric tale. 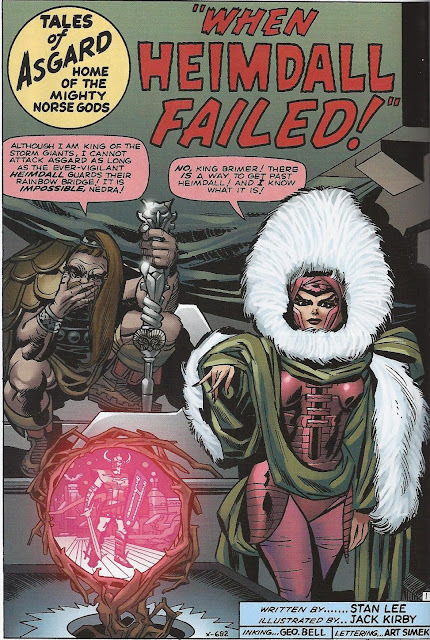 It begins with King Brimer of the storm giants conspiring with Queen Nedra to attack Asgard. They know that nothing escapes Heimdall though, and must come up with a way to break the realm's defenses. Nedra is apparently some sort of witch or conjurer and she summons up and air elemental -a Vanna -to serve her. She says that even Heimdall will be unable to detect it, and it can move through Asgard, spying for them. The sprite-like creature agrees to serve (not like it has much of a choice) and goes flying off towards Asgard. Doug: In the panel at the bottom of page 2, I thought we were seeing the return of the Impossible Man! The little sprite looked just like Impy! Are we to assume that Nedra is a giantess? If she is not, then there were some major problems with scale in the introductory scene. So we should assume that Heimdall is susceptible to magicks of concealment? I find that difficult to believe, since he can see across space and time, but I'll roll with it here. Karen: The Vanna flies towards Heimdall as he stands watch on the bridge. Although he is unable to see it, the warrior feels something is amiss and even swigs his sword in the air, berating himself for acting so oddly. He's gripped with a sense of uncertainty. Meanwhile, the Vanna flies over Asgard, noting the weaponry and troops available to Odin. The little bugger gets so full of himself, he even flies into Odin's royal chambers, where the All-Father is holding a counsel. A messenger arrives and informs Odin that Heimdall says even though he has seen nothing, he feels the realm should be on alert. This concerns Odin, and he focuses his powers. As he does, the Vanna flies past him and the All-Father commands the creature to show himself. The lord of Asgard grabs the sprite in his gauntlet, astounding his men. The creature proclaims his innocence but Odin orders him to be silent. Heimdall is summoned to the chamber. The guardsman is dejected -he tells Odin he has failed and deserves whatever punishment Odin sees fit to give him. But Odin will have none of it. He tells him to rise -he hasn't failed! Even though he couldn't see the Vanna, he sensed the evil creature and risked the scorn and derision of others by reporting his fears to Odin. Odin tells Heimdall that he has a place in his heart second only to Thor. Wow - he really caught Odin on a good day! So Heimdall goes back to guarding the bridge and all is well with Asgard. Doug: Is it just me, or did the Vanna look like a pink sperm making its way around Asgard? 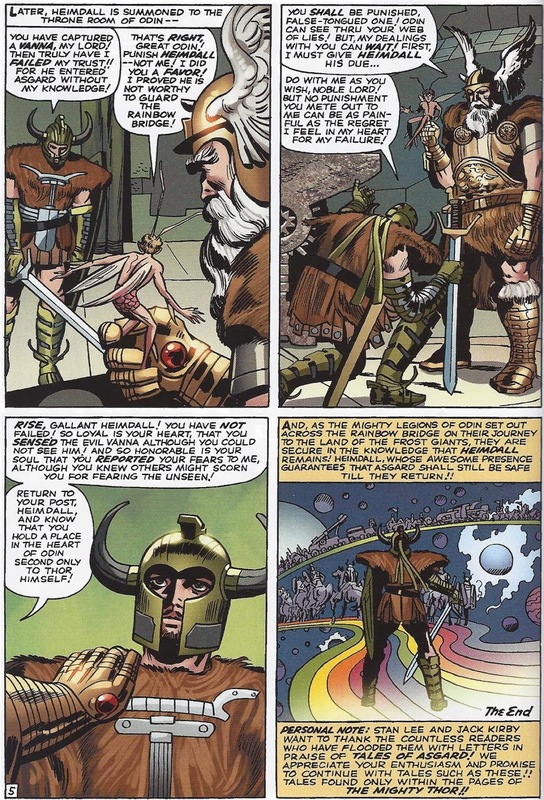 At first I was going to say "segmented worm", but upon further inspection... As I said last week, I'm always amazed at Kirby's juxtaposition of the archaic and the cosmic when depicting Asgard. Here we see beings of great power who dress in some stew of Greco-Roman/medieval garb and weaponry, but with these huge laser cannons. It's a weird sort of awesome. Karen: I think that interpretation is all you buddy, but now that you mention it, I do sorta see it...OK, that's kind of disturbing now. Doug: Then we have indeed crossed into new territory on the BAB, with the inaugural use of the word "sperm". I'm glad we've finally gotten that out of the way! 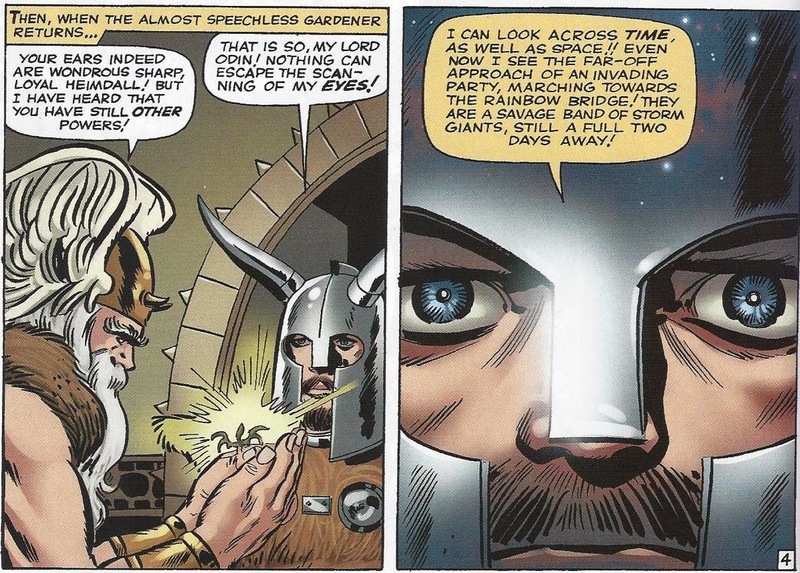 Doug: It would be difficult to decide who is the nobler soul -- Balder or Heimdall. Each is about as selfless as they come. I loved the depiction of Heimdall in the first Thor movie -- along with the Destroyer, he was one of the real bright spots in that picture. Karen: Just as an aside, the final caption of this story is a "personal note" to the readers thanking them for their enthusiasm for these Tales of Asgard. 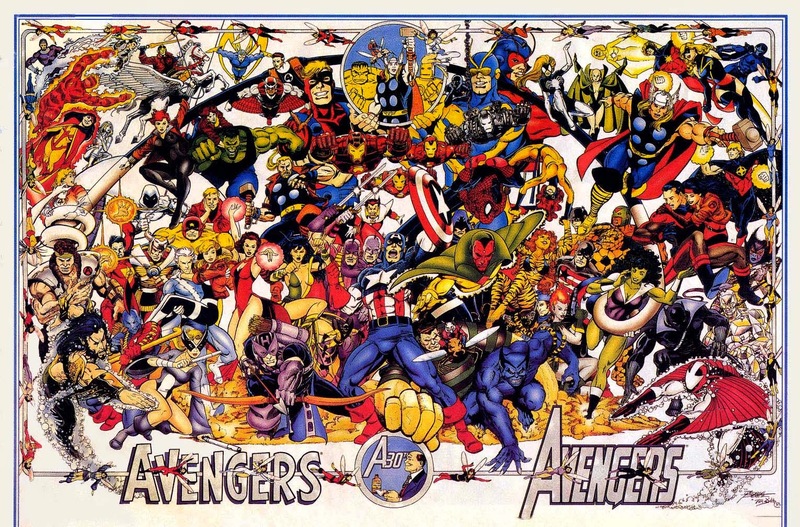 I wonder if this was just more Marvel hyperbole, or if there really were a lot of letters written praising the series? I think these early stories are nice, but the later, continued ones, like the Harokin one, were really something. I'm sure we'll get around to reviewing those eventually. But I wonder now what the actual reader response was? Doug: That is indeed an interesting query. We're troubled by our doubt of that due in no small part to Stan's unabashed promotion of himself and of the company, but we also live in a world where people can gain employment as "paid reviewers" of consumer goods. One does have to wonder. But, and I have no insight, my guess is that they did get a positive response to this series. I know that I really like it! I can honestly say that in books I read from the Silver and Bronze Ages, I do not at all mind when the feature is only 14-15 pages and a nifty little "extra" was tucked in the back. Doug: Here's another round of those mastheads we've used over the years to liven up the place. Enjoy! Saturday Morning Memories: Lancelot Link, Secret Chimp! Karen: My older brother absolutely hated this show, but I loved it. It caused some fights over the TV, I can tell you that! But really, who could hate the Evolution Revolution? 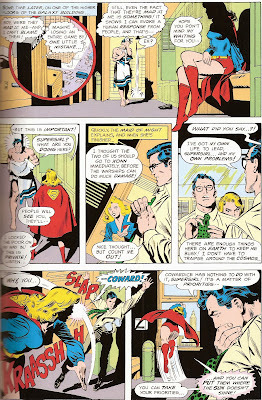 Doug: It was two months ago that we began this 3-part look at the Bronze Age Man of Steel under the influence of the pencil of Jose Luis Garcia-Lopez, and I'll attest to it being a visual pleaser. However, I've only been lukewarm to the story. What will this conclusion bring us? Why wait? Doug: When we left Superman, he was pondering his future after the revelation from Supergirl that they were not Kryptonians but mutants -- the outcome of their fathers' experiments with atomic energy. 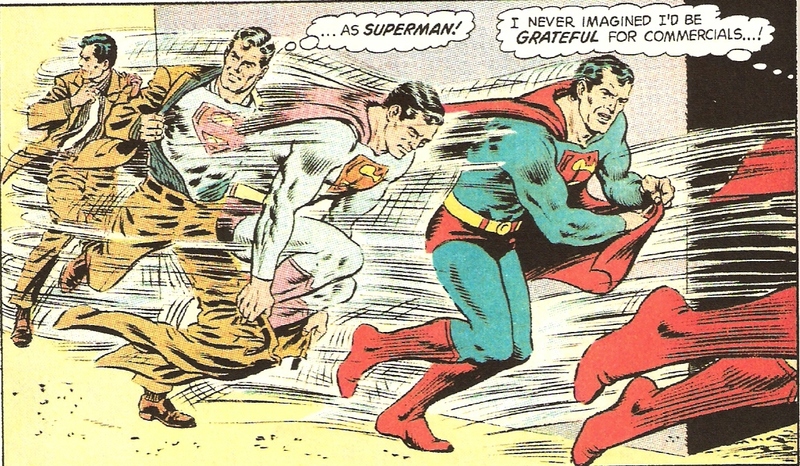 Superman had just beaten two environmental terrorists named the Protector and Radion. Now we see him doing what Batman usually does -- cleaning up the streets of Metropolis. 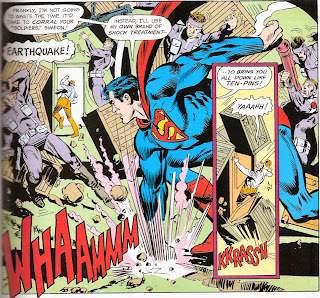 But this time it's finding and thrashing a mob operation in the suburbs, and Superman makes quick work of the crooks. Of note in this section is the mention of Chicago, which always troubles me when reading in the DC Universe. C'mon -- it's either our Earth or it isn't. I can deal with Metropolis and Gotham City if that's all we ever get. Whenever writers started to mix in real cities it becomes incredibly problematic. 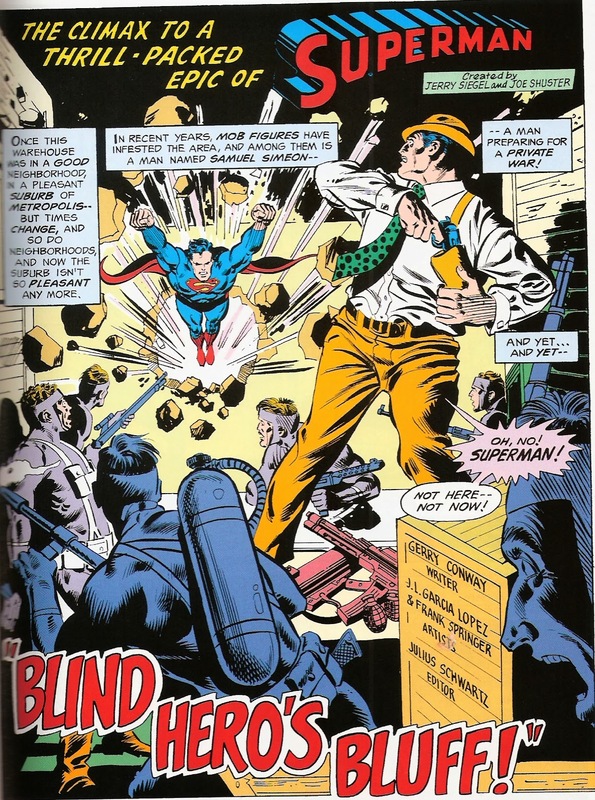 The police chief gives Superman a backhanded compliment when he thanks him for corralling Samuel Simeon's gang, saying he's surprised Superman would assist the police in such a small-potatoes matter. Superman says it's his planet, and he needs to deal with the details from now on. It's an awkward exchange to say the least. 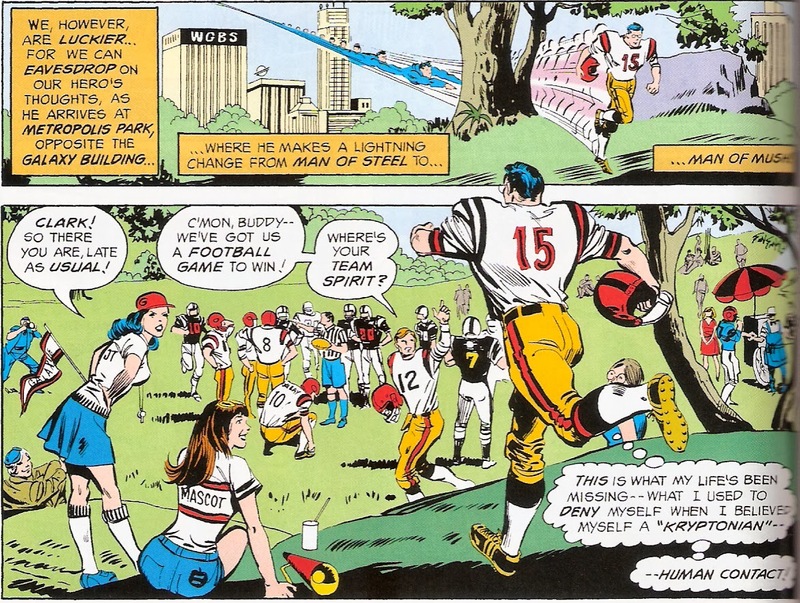 Doug: We're treated to another terrific looking if highly implausible costume change as Superman descends like a missile into Metropolis Park, changing into a full football uniform (what, was it stuffed in the pocket of his cape??) and reporting for action in a scrimmage game between local media outlets. 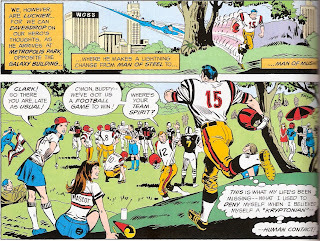 Clark's distracted as the game begins, though, and takes a hand-off and abruptly heads toward his own goal! His teammates don't tackle him in time, though and the GBS team ends up losing the game by one score! I'd think that hitting Clark Kent would be like tackling a tank. We cut to Supergirl, who has arrived to an unknown location in answer to a distress call. She's addressed as "cousin", called by her Kryptonian name, and it's obvious that those assembled know what's been going on with "Kal-el". A space armada is encroaching on a planet, and our mystery men are quite concerned. Supergirl says she'll alert Superman and they'll take care of it. But one of the men casts a doubt on her plan -- whereas Superman once believed himself a "man of the universe", he perhaps no longer does. Supergirl scoffs at that idea, and flies off to enlist Superman's assistance. Doug: In Clark's apartment he's emerging from the shower, still smarting from his dumb Jim Marshall play. He's shocked to see Supergirl waiting for him -- I had to laugh at the picture of Clark trying to cover his chest as he saw Supergirl; Namor wouldn't care. 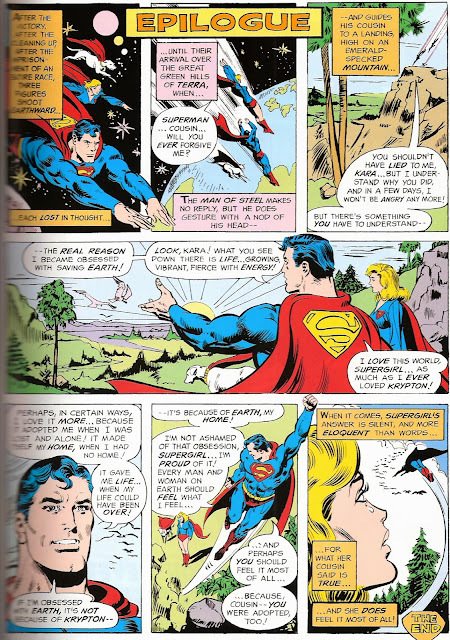 Supergirl explains the danger to the planet Xonn and implores Clark to come with her. 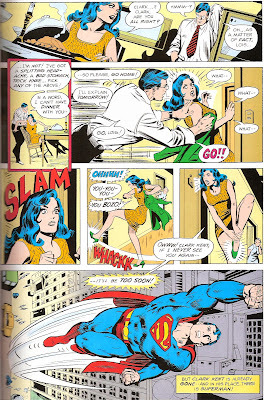 When he balks, saying he has revised his priorities, Supergirl slaps him up against a wall and storms out on her own. She tells him in no uncertain terms what she thinks of his priorities. 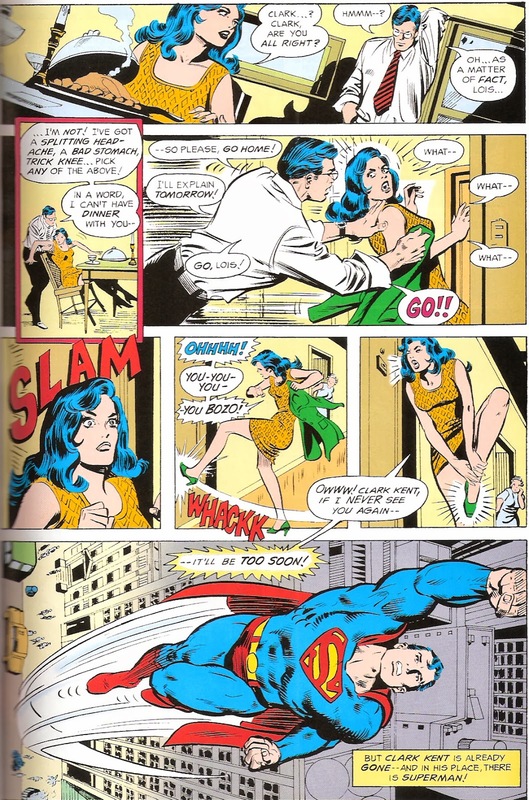 Doug: Lois is over for dinner -- pretty nice how she comes to Clark's apartment to cook for him. He's daydreaming out the window, thinking of what Kara had called him -- a coward. His eyes wander to the place where Xonn is located and he zeroes in with his telescopic vision. What does he see? 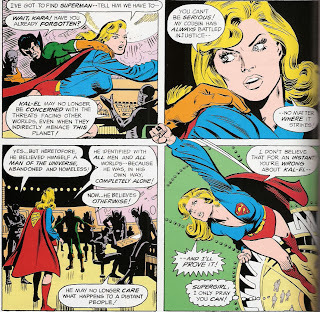 Supergirl and Krypto fight valiantly against the invasion force, but are soon knocked out of the fight. Clark now knows what a mistake he's made. 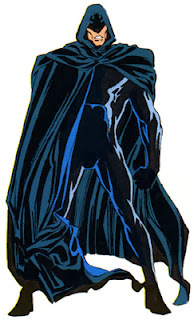 He quickly (brusquely) hustles Lois out the door and speeds off to the sector where Xonn is. His movements are monitored by our mysterious meddlers. 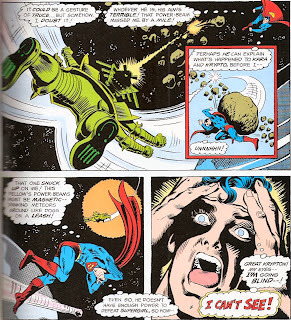 Doug: Superman tears through the fleet with little difficulty and wonders to himself why Kara could not have. He sees a large green humanoid emerge from a craft and head toward him. Taking a defensive posture, the Man of Steel thinks he has it made when the being's attack misses to the right. However, there's a boomerang effect to the asteroid that was struck, and it hurtles at Superman from behind and knocking him off balance. And then he's washed over with horror -- his eyesight is gone! It's not long until he's immobilized by his assailants. Now inside a large vessel, he's reunited with Supergirl and Krypto. 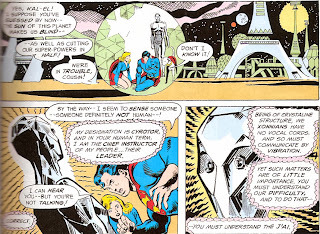 Kara explains that under the influence of Xonn's sun, Kryptonians are blind and half of their superpowers have gone. What's everyone's opinion of the multi-colored suns aspect of Superman lore? Brilliant literary device, or seemingly built in deus ex machina? Doug: Our Kryptonians are approached by a crystalline character (Martinex's long-lost relative?) named Cyrotor, who explains what has befallen Xonn and why resistance is futile. Xonn is being attacked by the J'ai, an alien race that has never known peace -- war is what they do. Additionally, when one of the J'ai dies, he is replaced by eight new organisms -- multiple reproduction to an exponential level. All warlike. 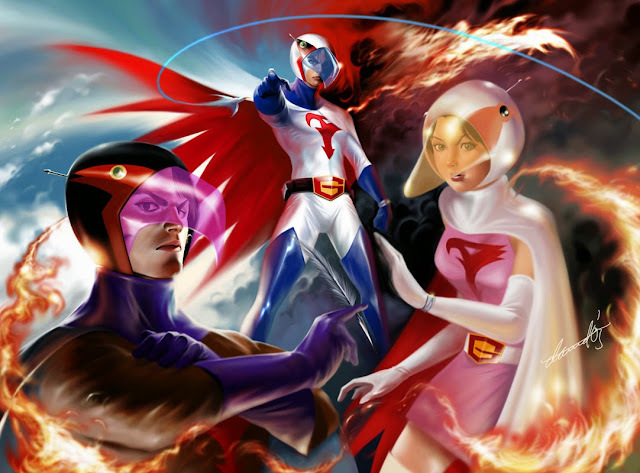 Cyrotor tells the Super-cousins that the J'ai cannot be defeated. 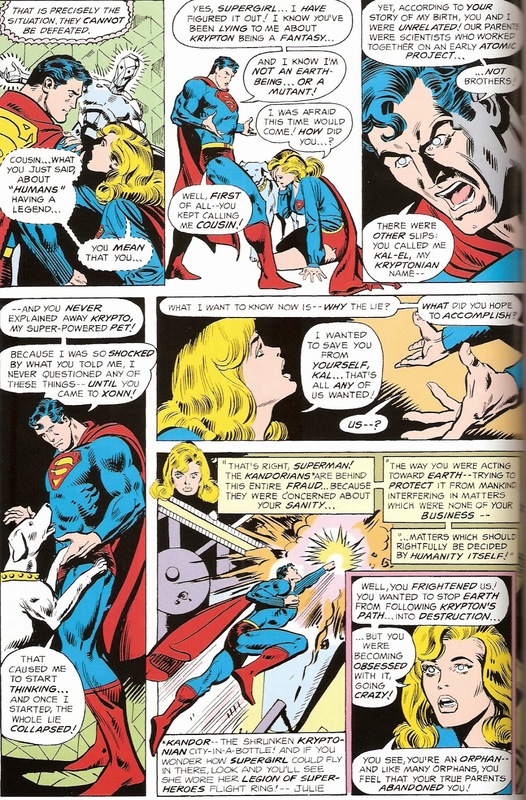 Supergirl gets suspicious of some of the word choices Superman is making in conversation with Cyrotor and begins to ask him... then he blows up in her face. He says he knows she's duped him about Krypton and is furious. 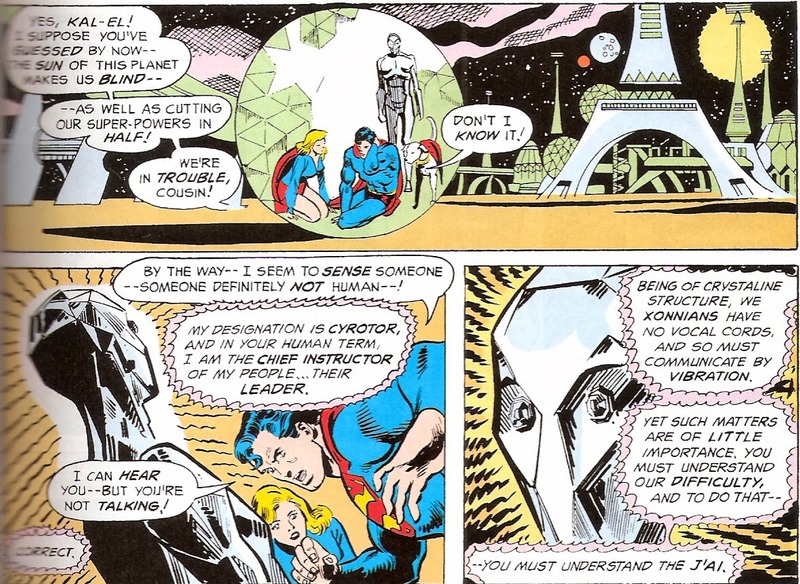 Kara uses the word "us", which leads to the explanation of the masterminds of the plan -- the Kandorians! All of them, and Kara, had become concerned that Superman had a fixation on the safety of the Earth, to the extent that he had begun to meddle in the affairs that Earthmen should be allowed to handle on their own. 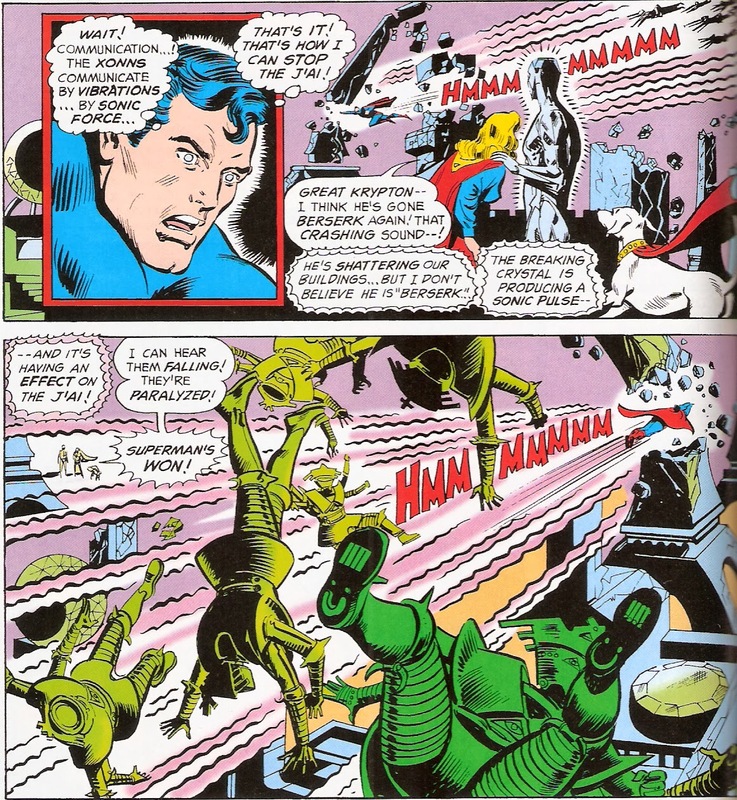 Superman goes ballistic about the entire ruse, and blasts out of their globe-like prison. He flies off to engage the J'ai alone. Doug: Superman is being weighed down by the sheer weight of the attacking J'ai, when he comes upon the solution to ending the attack. The J'ai do not seem to communicate with each other -- they swarm like bees. 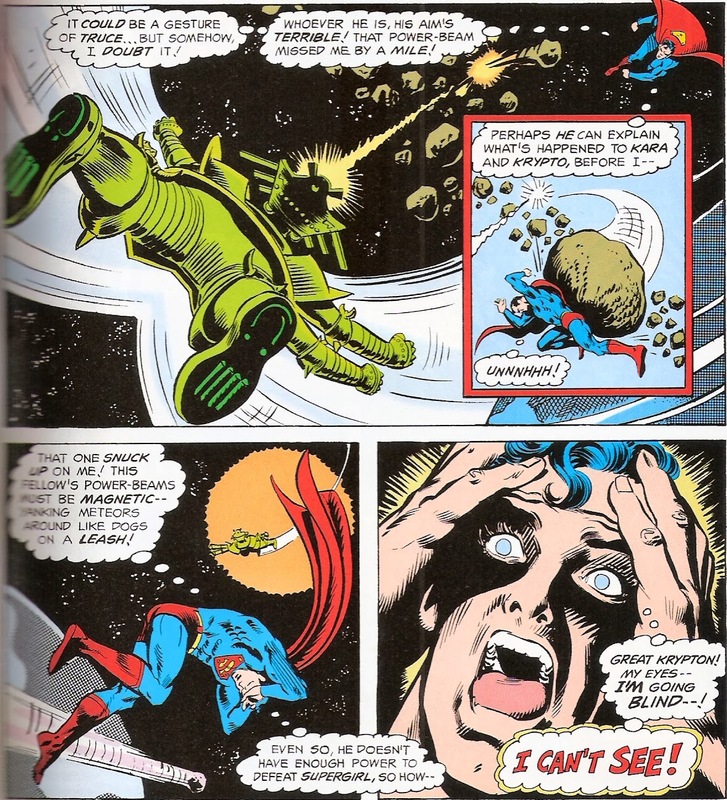 Somehow Superman comes to the conclusion that since the Xonn communicate through sonic waves, shattering their buildings will somehow negate the life engergies of the J'ai. OK -- sure! Why not?! As the Man of Steel flies on a frantic mission of destruction, leveling building after building, Cyrotor and Supergirl watch from afar. The J'ai collapse as a group, their threat ended. Later, the three Kryptonians fly through space, heading back to Earth. Once near our atmosphere, Supergirl asks her cousin if he can forgive her. He nods affirmatively, and adds that the reason he became obsessed with saving Earth is due to its beauty and immense relevance in his life. And she, as a fellow Earth adoptee, should feel the same way. And with that, Superman takes his leave. Doug: Well, alrighty then. I'm just not sure what to make of this. As I said at the top, the art was nice to look at throughout the three issues. I'd said earlier that Garcia-Lopez especially did a great job of depicting flight. He also wowed with the super-changes; the taxi cab wardrobe switch last issue was my favorite. Plot-wise, I'll stand by comments I've made around here since we opened shop here over four years ago: this is a Bronze Age DC, and it reads like it was written with a 10-year old boy in mind. It's not awful, and I suppose I can swallow what Gerry Conway and Julie Schwartz were selling. 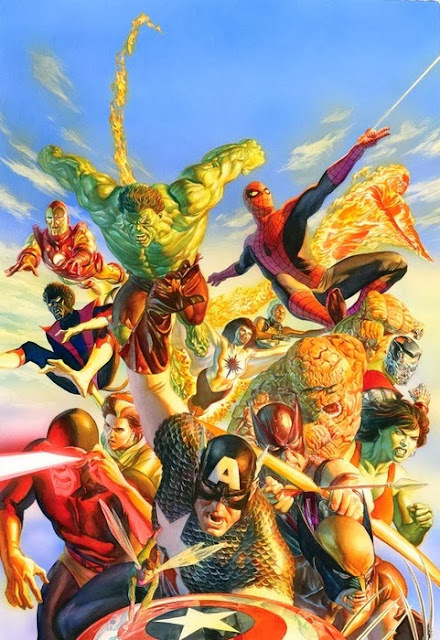 But given my druthers, I'd make mine Marvel nine times out of ten. 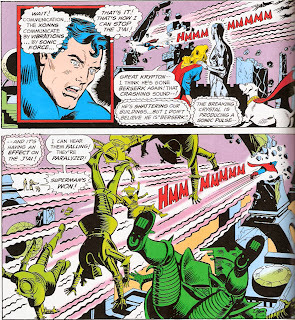 However, and I said this at the conclusion of my review of Superman #307 -- I respect Gerry Conway's talent for being able to write under two very different "house styles", or at least house "expectations". It's a well-written, if not so greatly plotted, story. And for what I perceive it to be, I guess I don't have that much of a problem with it. The Dark World -- It's a Spoiler-Filled Thorsday! 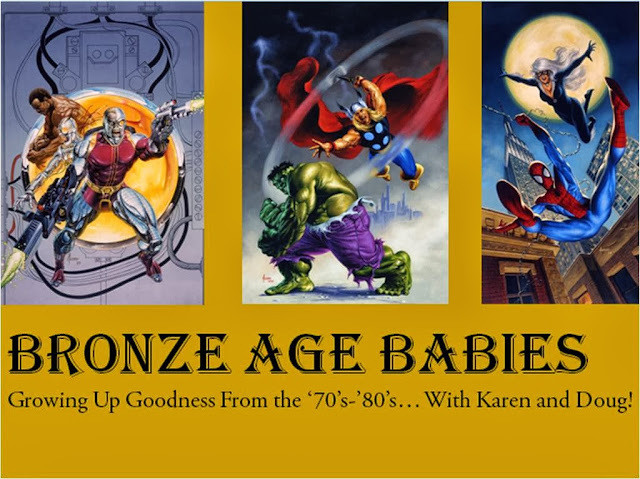 What's So Golden About... Marvel Comics 1?